Hello! I hope you're having a great week! I'm here with a spooky Halloween card today! 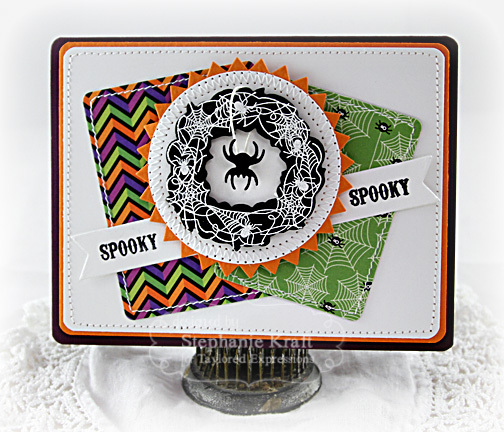 I used the Spooky Wreath set, one of the many petite wreath-themed stamps. This one that I never had a chance to ink up before. I embossed it with white detail embossing powder onto black. Love how it makes the wreath pop more. I used last week's Mojo sketch (#309). Accessories: Taylored Dies: Banner Stacklets 1, Labels Stacklets 6, Pinking Circle Stacklets, Seasonal Wreath, Spiders & Spiderweb (TE); Standard Circle Nestabilities - SM (Spellbinders), 1/4" Round-it-All (Zutter), White embossing powder, Hemp cord, Foam tape, Thread, Sewing machine. Fabulous use of the Mojo sketch :) Darling card. Such a fun card, Steph! I just love the white spider wreath embossed on the black, Stephanie, and what beautiful sewing...this is one, gorgeous Halloween card!!!!!!!! Super cute Halloween card Stephanie! Love the fun and bright colors and the spooky little spider! Favorite card with this sketch! Spooky sweet card Steph. Love the spider web wreath and the stitched pieces.